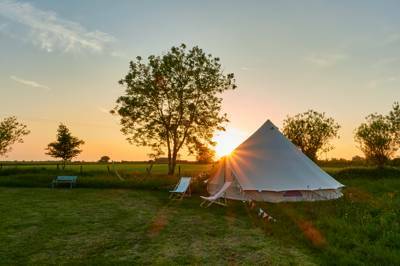 Try our beautiful, fully-furnished canvas Bell tent, boasting a double bed, camp kitchen and hammock. The tents are all named after our favourite local walks (Burrington, Ebbor and Cheddar), and feature a lovely lounge area, vintage storage trunks, picnic table and outdoor cooking set. All bedding is provided and we can supply camp beds for children if needed. 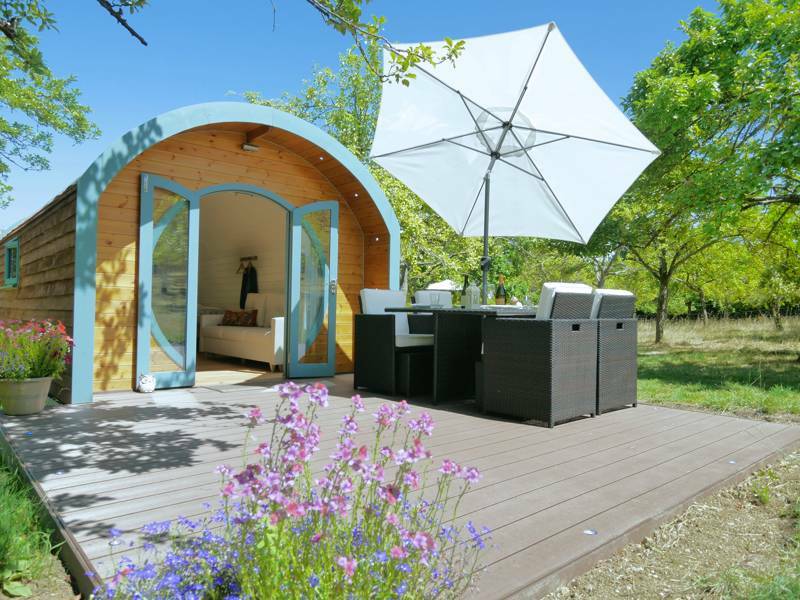 Try our beautiful, fully-furnished canvas Bell tent, boasting a double bed, camp kitchen and hammock. The tents are all named after our favourite local walks (Burrington, Ebbor, Cheddar and George), and feature a lovely lounge area, vintage storage trunks, picnic table and outdoor cooking set. All bedding is provided and we can supply camp beds for children if needed. For latest availability and best prices for Moor View, please use the Date Search above. Bell tents feature a proper double bed with bedding, bedside tables, a wood burner with plenty of logs, a hammock, deck chairs and picnic table, a trunk for storage and a cool box for food, lights, rugs and floor cushions. Roll out beds for children can be added (up to three per tent). An outdoor kitchen set has a huge grill pan for the ultimate fry-up and all the plates, cutlery and crockery you need. 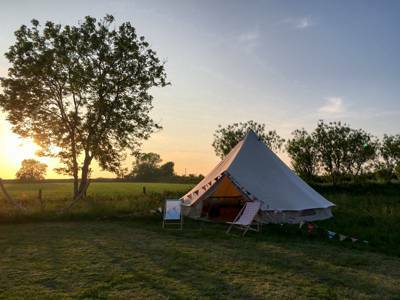 For all guests there is a communal bell tent with games and toys in for children, composting toilets and gas powered outdoor showers and a provisions store with a fridge, freezer and local produce available to purchase. There's also a communal fire pit. It's a 5-minute walk to the village of Priddy, home to one of the largest underground caves and potholing networks in the country. Here you can go on dramatic underground walks and tours. Famous Wookey Hole (01749 672243) and Cheddar Gorge (01934 742343) caves are also both just a few miles from the campsite and will offer a full day of family entertainment. Wells, England's smallest city is a 5-minute drive from the site and contains the magnificent Wells cathedral and Bishops Palace (01749 988111). Another 5 minutes’ drive and you are in Glastonbury where you can explore the characterful town centre and of the course the famous Glastonbury Tor and abbey (01458 832267). For bird watchers and nature lovers the Somerset Levels have several reserves and hides. 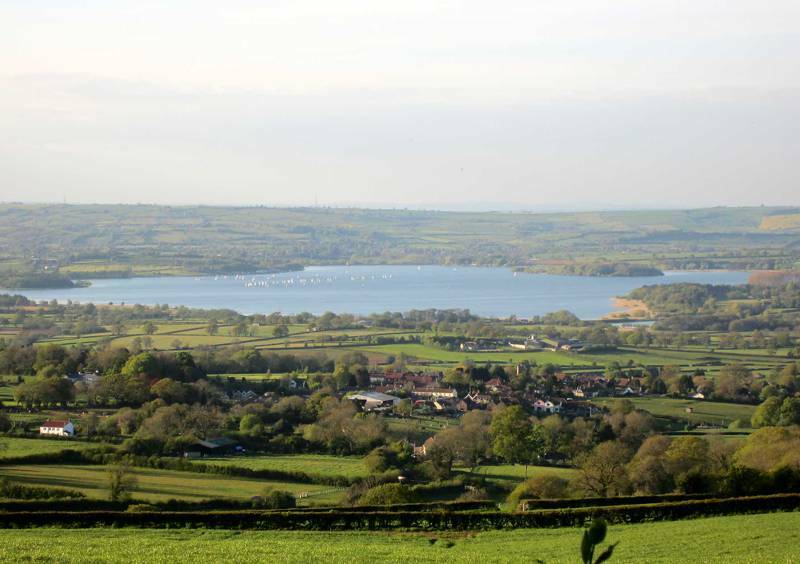 The Priddy Good Farm shop (01749 870171) has a wide selection of locally produced food and drink and by prior arrangement the campsite is happy to put together food boxes for guests. Five minutes from the campsite is the Queen Victoria Pub (01749 676385) offers good quality pub grub for both lunch and evening meals, while the City of Wells has several fine bars and restaurants including The Sub-house (01749 670800), Magpies (01749 938090) and The Good Earth (01749 678600) – excellent vegetarian and vegan food. From the North (Bath/Bristol) along the A37 head south towards Wells/ Shepton Mallett. Continue South past the Farrington Gurney Junction and up the hill. At the top of the hill the road splits, stay on the main road which now becomes the A39, sign posted to Wells. Continue on the A39 and go through Chewton Mendip and then over the Green Orme Junction. Approx. half a mile after the Green Orme Junction Turn Right, sign posted to Priddy. Continue straight along this road until you enter the village of Priddy. As you enter the Village there is a left hand turn and a sign for the Queen Victoria Pub, take this turn. Continue past the Queen Victoria Pub (on your right), head out of the village and continue along pelting Drove for approx. half a mile. Moor View is on the right and will be clearly visible. From the South, the City of Wells. Take the A371 until you pick up signs for Wookey Hole, drive through Wookey Hole with the Wookey Hole attractions car park on your left. You slowly climb up the hill staying on the road and heading right on Deer Leap where the road forks with Ebbor Lane. Continue up the hill past the Ebbor Gorge CarParks on your right and then the Deer Leap Car park on your left. Moor View is on your left approx. 200 meters past the Deer Leap carpark. You will see the White House first with the camping in the meadow behind.